Blog 30 Unique Things to do in Namibia! There are so things to do in Namibia that it can overwhelming to plan a trip around the desert country. Namibia is a country unlike any other and sits at the top of our list of favorite places in the world. I remember our trip to Namibia like it was yesterday. The deep red sand, silence of the desert air, wild animals, desert tribes, and encompassing landscape all grab ahold of you. Namibia is like another planet. We talk a lot about returning to many countries, but Namibia will be a reality. On top of that, it’s one the easiest and safest countries in Africa to travel. 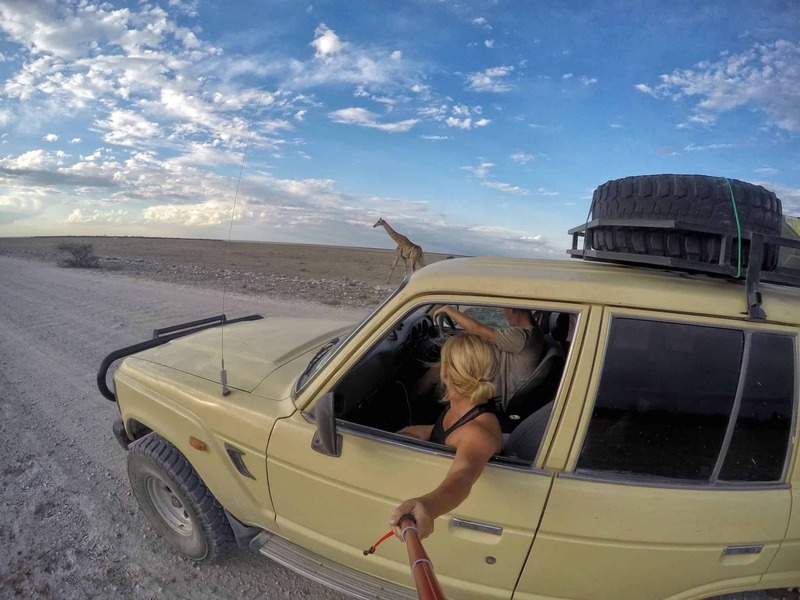 Just like us, Namibia will entrance and leave you yearning to explore more. Which is surprising as the country is empty and the population is sparse. Don’t be deceived there are so many wonderful things to do in Namibia. Sossusvlei is the one place in Namibia of which everyone has seen a photo. The dunes in this section of the Namib Desert are considered the highest on earth, but it is hard to describe the sheer scale in writing. 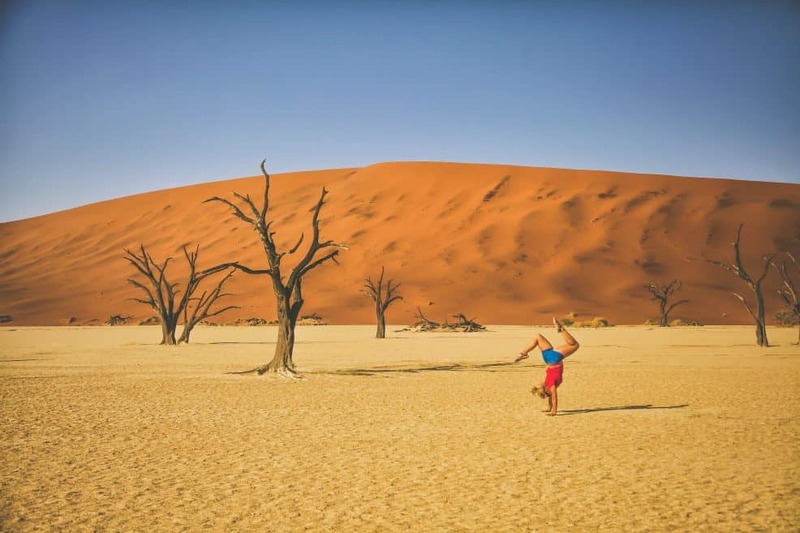 Despite being Namibia’s number one tourist attraction, due to the sheer size of the dunes and desert here, one can still find complete solitude. The dunes tower over visitors, at 325 meters, with high winds sculpting a changing landscape. Seeing these dunes in person will take your breath away. If you can only do one thing in Namibia I would recommend heading to Sossusvlei. As the Namib-Naukluft gates open before sunrise, visitors make a mad dash for Dune 45. It’s not the highest dune in the Namib Desert, but it is the most popular because of its location right off the road and is often the most popular things to do in Namibia. 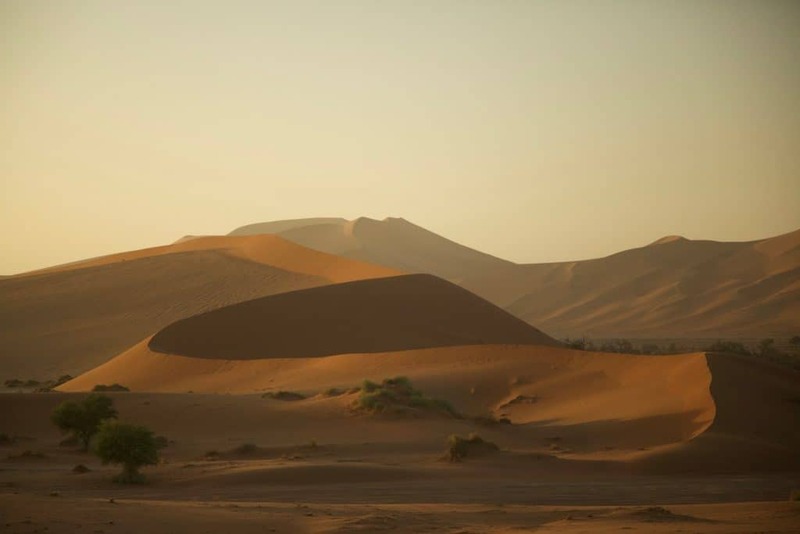 Dune 45 rises over 80 meters and is composed of 5-million-year-old sand blown in from the Orange River and the Kalahari Desert. 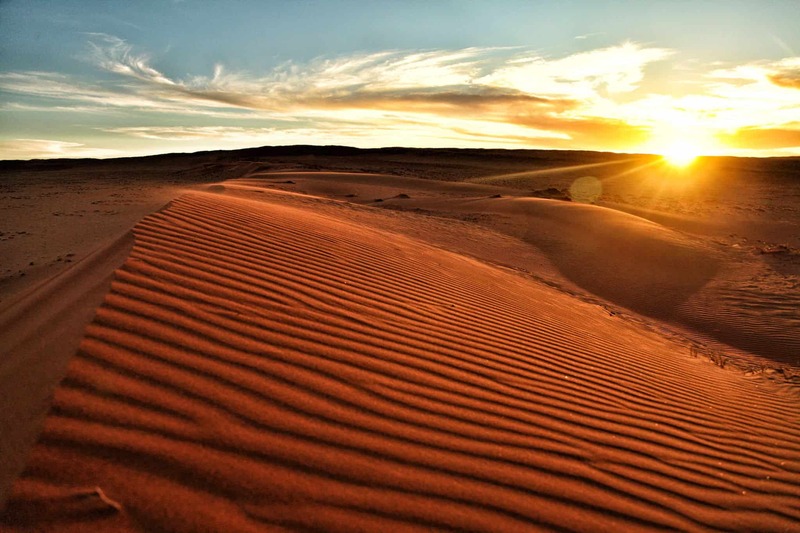 Dune 45 is the most popular spot to watch the sun come up over Sossusvlei. It gets popular as backpackers and independent travelers make their way here every morning for the “gram“. To make it into Sossusvlei before sunrise you must stay overnight in the park’s campsite. Campers are the only ones who have access to Sossusvlei before the official gate opens. You will need to be up well before the crack of dawn to be on the first to the dunes and climb it. We woke up at 4 am, broke camp, and drove like hell to see the sunrise. An alternative way to watch the sunrise is to drive past the groups at Dune 45 and find your own dune to climb. That way, you get the beautiful red dunes and the sunrise all to yourself. Don’t worry – there are plenty of dunes to go around! 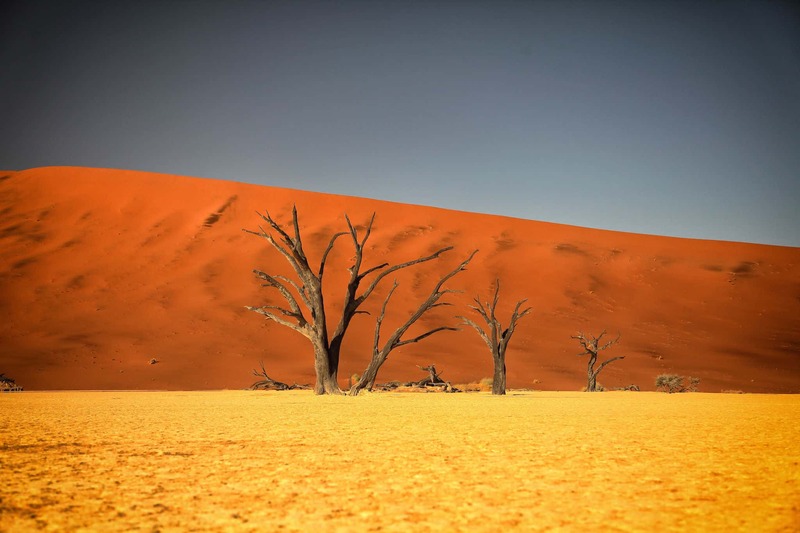 Vlei is the Afrikaans word for “marsh” and that’s exactly what Deadvlei is – a dead marsh. Trees in this white clay pan are long dead after drought and climate change cut them off from water long ago. Nevertheless, they are still beautiful. The pan is surrounded by some of the tallest and most impressive dunes in the world, making this a photogenic spot. The road to Deadvlei is a deep sand road, and a 4×4 vehicle is required. If you arrive without a 4×4, the road ends in a parking lot where guides will drive you in for a small fee. It’s best to arrive at Deadvlei before 10 am if possible, as the area gets unbearably hot late in the day. Deadvlei and Sossusvlei are nearby to eachother. My advice would be to head to Deadvlei right after watching the sunrise over Sossusvlei, before the sun gets scorching hot. During the Apartheid era, laws in Namibia prohibited native Africans from entering bars or liquor stores. So, “shebeens” or illicit pubs, sprang up in many townships to serve the disenfranchised. Shebeens became an important part of not just Namibia, but many African communities. They were well known for lively parties, live music, as well as a gathering place for political organizing. This tradition inspires the name, decor, and ambiance of this popular and very worthwhile bar outside of Etosha National Park. 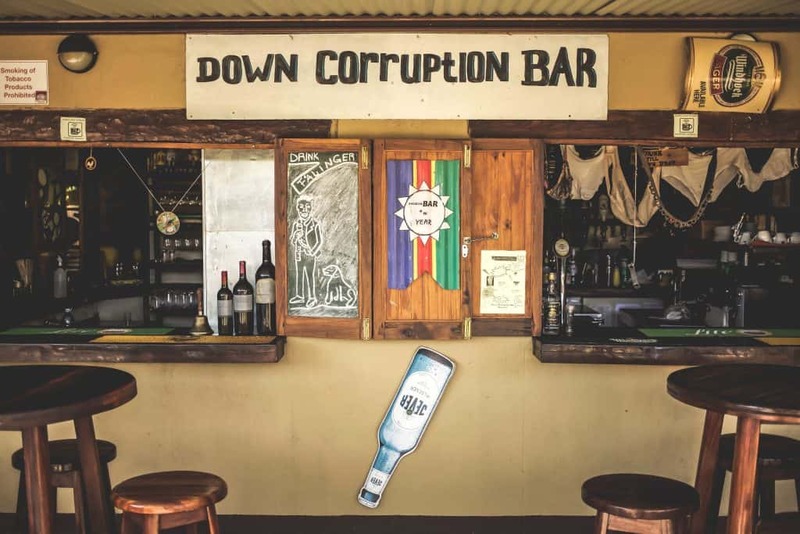 Having a drink in this bar is one of the best unknown things to do in Namibia. This bar is located inside Gondwana’s Etosha Safari Camp, an affordable place to stay while visiting Etosha. You don’t have to be a guest to enjoy the bar. It’s also a restaurant and museum and serves up cold drinks, good food, live music, plenty of historical memorabilia for all. 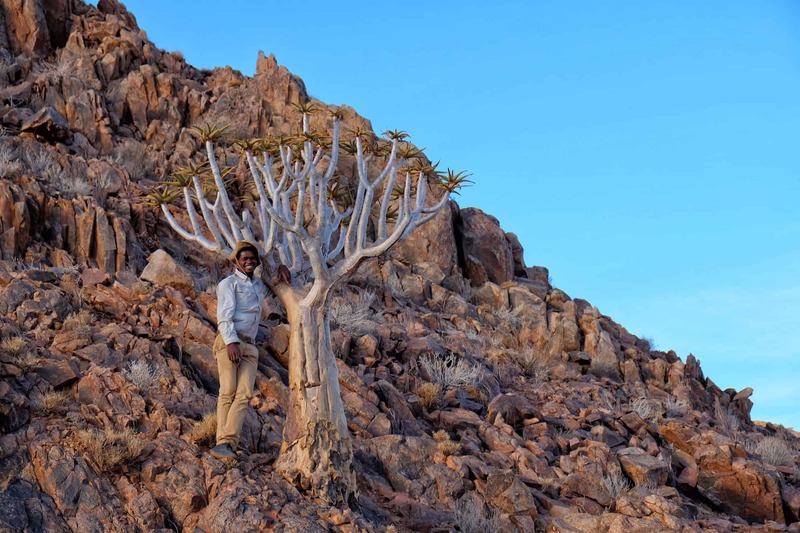 14 km north-east of the town of Keetmanshoop is the Quiver Tree Forest. The unique quiver tree can be found throughout Namibia, but the Quiver Tree Forest boasts 300 of these iconic Namibian trees in a very small area making it the perfect and guaranteed spot to see the trees. Be sure to watch out for the quivers as they have poison-tipped arrows. Although the poison part makes us quiver at the thought, the trees are considered good luck for those who worship and nurture them. The few visitors that make it to this region of Namibia are rewarded by proximity to desert elephants, giraffe, lions, and the Himba people. Kaokoland is one of the last wilderness areas in Southern Africa, but visiting here doesn’t come easy. You’ll need a four-wheel drive vehicle and have to be self-sufficient on your journey north. Roads here are a limited patchwork of dry riverbeds and rough paths that are more often trails or dry riverbeds. 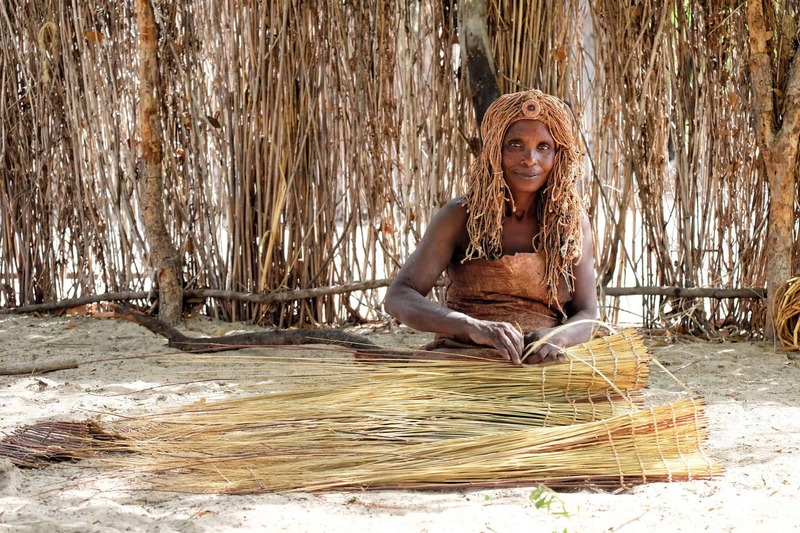 Kaokoland is also where the Himba people live. Yes, the real Himba, not the ones available to tourists for photos at the popular hotspots. The Himba are considered to be one of the last tribes of Africa living as they have for centuries with little use of modern technology. The Himba paint their skin in a distinct ochre to protect themselves from the harsh Namibian sun and are frequently the subject of photographers who come from all over the world to capture their images. 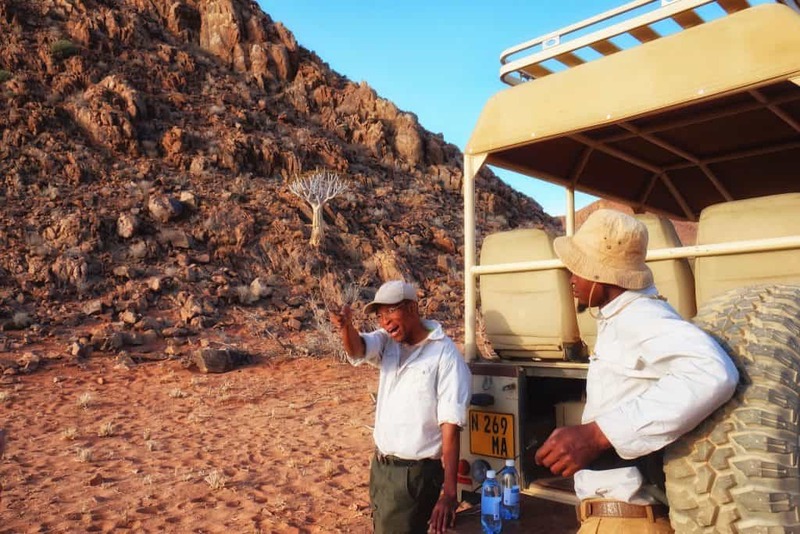 If you’re an avid Planet Earth watcher you may have heard of Damaraland. Damaraland is one of the most picturesque areas of Namibia and where you can find all the great animals of Africa. In Damaraland, granite formations mix with ancient riverbeds, grasslands, and mountains and the beauty is so great you may want to pinch yourself to make sure you’re not dreaming. Damaraland is similar to Kaokoland, and togehter they form an area known as the Kaokoveld. The chief difference between the two areas is the ease and accessibility. 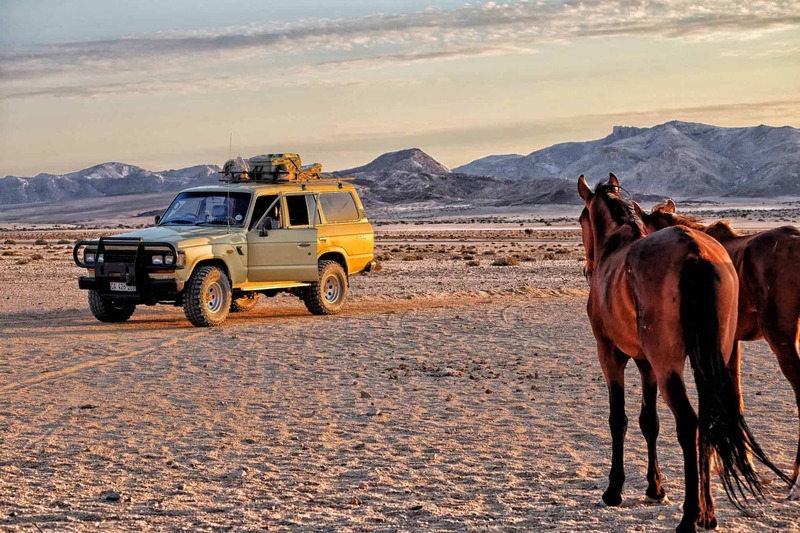 In Damaraland, there are a number of roads, campsites, and lodges that make travel much easier. The Kavango River flows from Angola through Namibia and forms the Okavango Delta in Botswana. The rich river is a vital source of water for all three countries and the wildlife that call it home. The river marks the beginning of the Caprivi strip in Namibia, making a swift departure from the rest of the arid country. 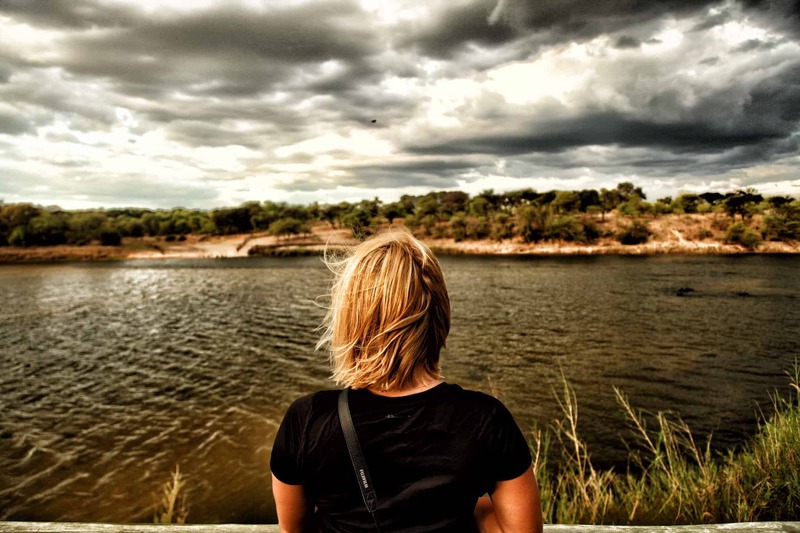 Here you can view a wide range of birds, hippos, and crocodiles, all while villagers paddle downstream in mokoros and carefully bathe along the banks. Days can be spent relaxing along the river and watching, or you can choose to join the flow: Boat cruises are super-popular in the region and best enjoyed at sunset. To linger longer, reserve a luxury chalet or floating bungalow at the Hakusembe River Lodge, located outside of the Namibian outpost of Rundu and across the river from Angola. Make a day trip of this peninsula located outside of the town of Luderitz. Here you will be treated to the company of a plethora of colorful local wildlife including brown hyena, oryx, and flamingos. Diaz Point features a lighthouse and cafe along with a replica cross that was erected by the Portuguese explorer Bartolomeu Dias in 1488, after making it to the Cape of Good Hope. The largest penguin colony in Namibia is nearby on Halifax Island, and is visible from here if you have some binos. The marine life in the surrounding waters around Luderitz Peninsula includes whales and dolphins and travelers have a good chance of spotting them from the beach, or you can join a wildlife cruise. 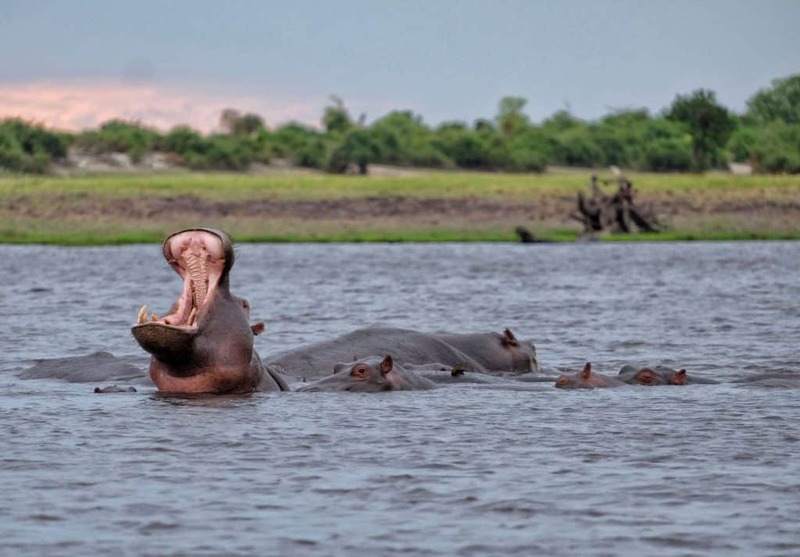 Unlike most of Namibia, The Bwabwata National Park, which is located in the Caprivi Strip, is fertile and green thanks to the rainfall and the Cunbango River, a river that forms the famed Okavango Delta in Botswana. Bwabwata is known as the “people’s park” because it is home both to wildlife and several villages. Thanks to a progressive restock and relocation program of rare species such as the red lechwe and sitatunga, the park’s non-human population has increased in recent years. This focus on becoming an ecotourism destination has benefitted the humans as well by increasing business and creating new jobs for the local population. 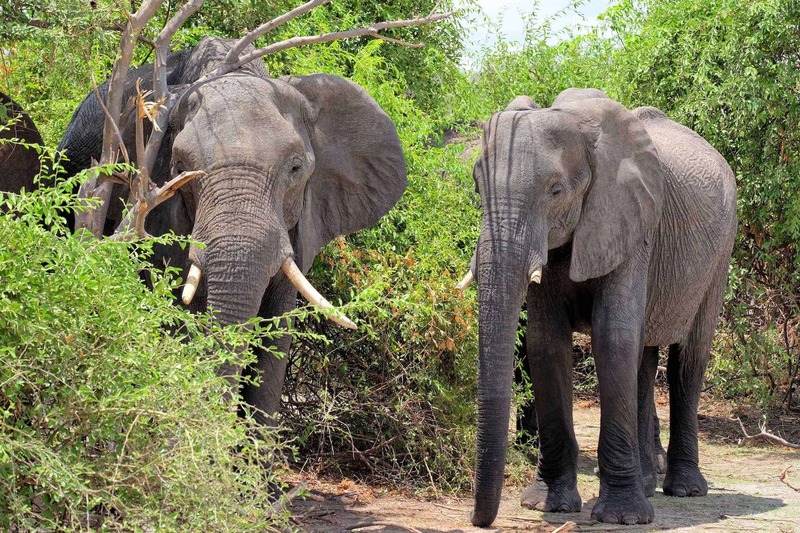 The park is a route for migrating elephants traveling from Southern Angola to Chobe National Park in Botswana. Known collectively as the KAZA region, five countries collaborate to protect the majestic pachyderms’ seasonal path: Namibia, Botswana, Angola, Zambia, and Zimbabwe. The Gondwana Canyon Village features hiking in a 127,000 hectare reserve, an area which had once been the province of local farmers until the Gondwana Collection purchased the land. Visitors can enjoy wandering through the interesting geology and getting as up-close-ish as they will allow with animals such as oryx, zebra, and jackals. The local lodge here was set up in the form of a small village oasis in the desert is accessible from the main road. We stayed here and enjoyed venturing around the desert before heading back to a comfortable lodge. For those seeking to relax and cool off, the lodge features one of the only pools in Southern Namibia—the perfect place to unwind amidst beautiful desert scenery. Located in the middle of the desert is the small settlement of Solitaire. Almost every traveler in Namibia makes a stop at this watering hole at the crossroads of C14 and C24, two major routes connecting Walvis Bay and the Sossusvlei section of the Namib-Naukluft National Park. Solitaire has the only gas station for miles; plus a repair shop, post office, bakery, and small general store. The town is decorated with the decaying ruins of old cars from various decades, which many travelers take as a chance to get a picture perfect “Namibia” photo. Walvis Bay often gets overshadowed by the nearby city of Swakopmund. But the 30 minute drive from Swakopmund is worthwhile. Walvis Bay is the country’s chief port town. The waters here are rich in plankton, drawing in many southern right whales each year. 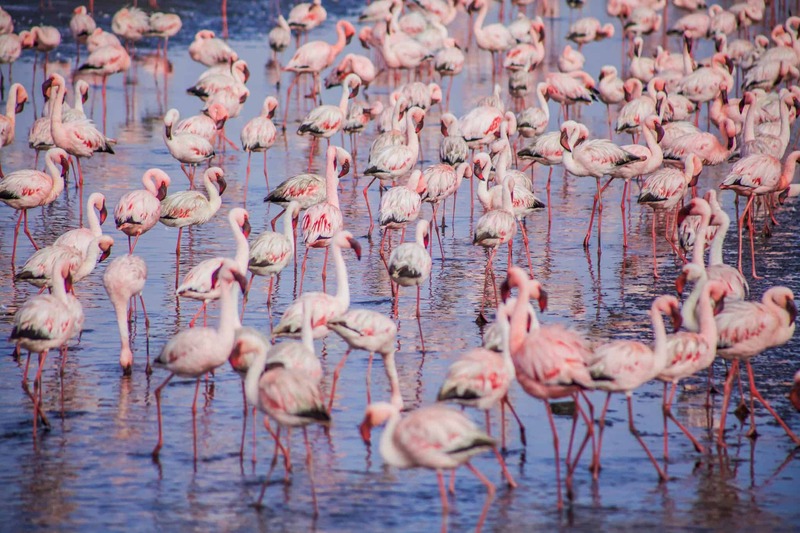 While many birds and sea animals make the area their home, Walvis Bay is known for hosting a population of approximately 35,000 flamingos. You can’t miss them as you are driving along the coast, and I would recommend pulling over to observe them for awhile. If you keep driving you’ll hit the tip of Pelican Point, a natural sand spit that stretches out into the ocean. Pelican Point gives visitors another chance to see more marine life. If you can’t find suitable accommodation in Swakopmund try Walvis Bay! On the Namibian side of the Chobe River are the brand new luxurious Chobe Water Villas. These villas are located in the Kasika Conservancy at the eastern tip of the Zambezi Region and are set on stilts above the flowing Chobe River. All of the balconies here look out onto the famous Chobe National Park and Sedudu Island in Botswana. The food here is exceptional and the hospitality on point. For activities, guests can leave Namibia to head into Botswana’s Chobe National Park across the water. One of our favorite things to do was take a sunset cruise with the staff and get up close to elephants, crocodiles, buffalo, and hippos from the boat. 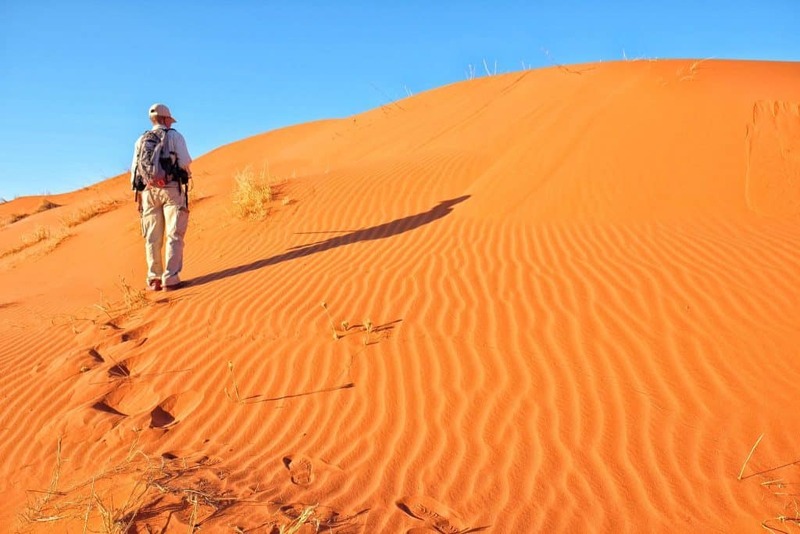 If images of towering red sand dunes, ancient rock formations, desert animals, sandstorms, and mysterious “fairy circles” are in your Namibian dreams, then the NamibRand Nature Reserve is where your dreams will become reality. This area is a 200,000-hectare non-profit private nature reserve in southwest Namibia. The focus of the reserve of which is the preservation and restoration of the Namibian land. 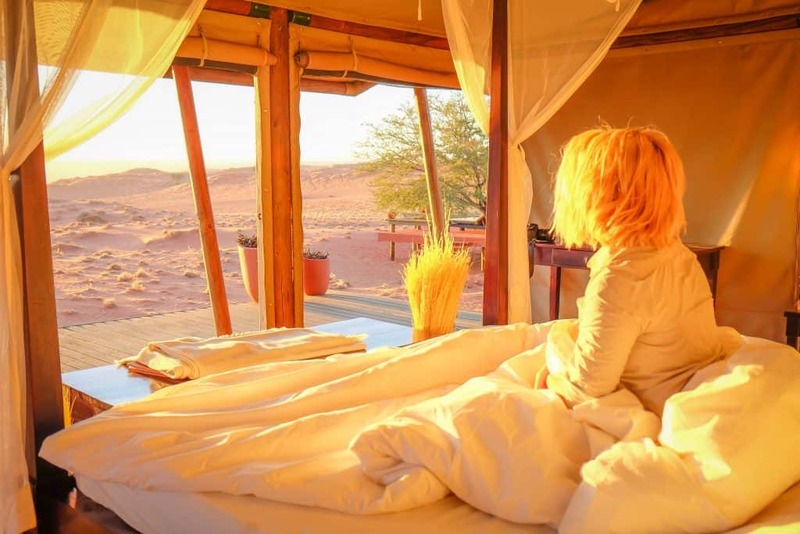 Wolwedans is one of the few lodges in this desert and is breathtaking. 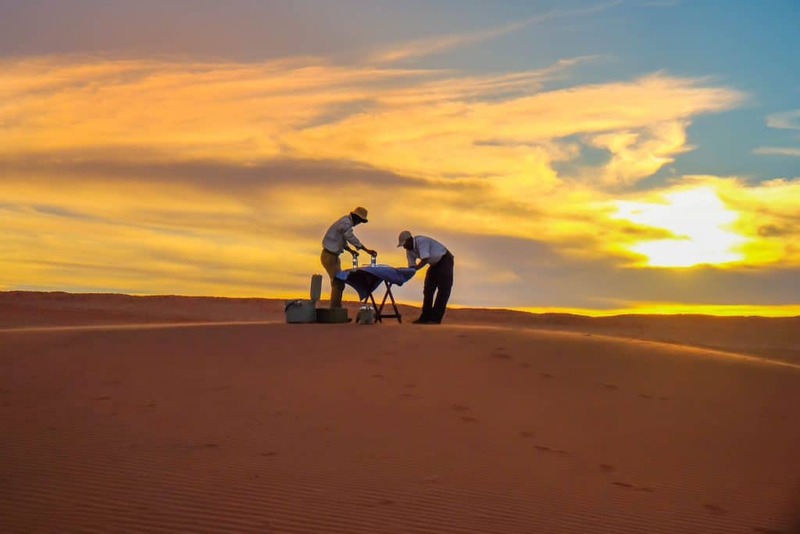 Waking up in a canvas tent while the sun rises over the desert is the best way to experience the beauty of the area and brings back great memories of Africa. 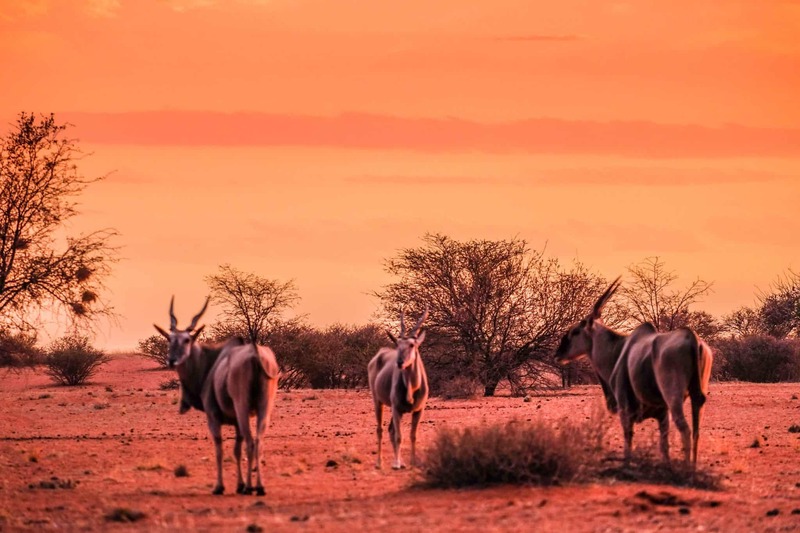 Wolwedans has been featured in countless travel publications and offers some of the best accommodations in all of Namibia, and all of Africa for that matter. It is the epitome of a classic African safari lodge. Focusing on sustainability and conservation, as well as high-end travel accommodations, the Wolwedans’ four main camps treat guests like royalty. Be prepared for lots of gin & tonics, wildlife, delicious meals, luxurious tents, and fiery sunsets. It’s by no means a cheap place to stay, but the experience is out of this world. Watching the sunset over the Kalahari Desert is a sensation to behold. 1.2 million square-kilometers of deep-red-toned sand, stretches across all of Southern Africa. Despite harsh conditions, the Kalahari plays host to a plethora of animals that have adapted to the environment. Lions, gemsboks, meerkats, zebras, and cheetahs can all be found in the Kalahari. 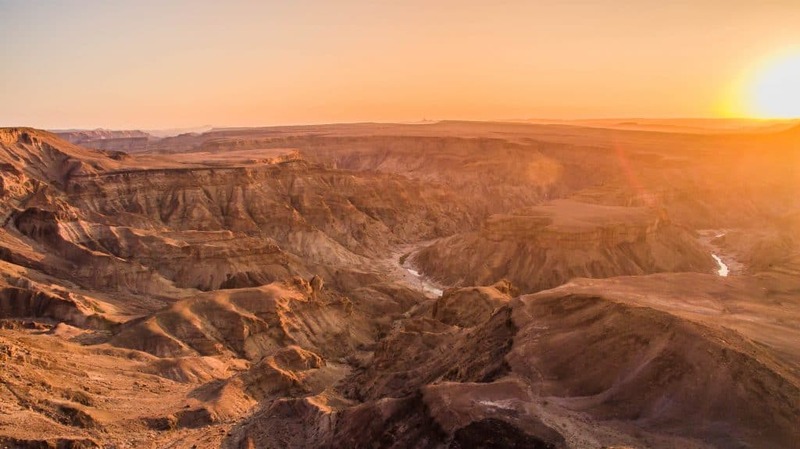 Fish River Canyon is the second largest canyon on earth and is magnificent to say the least. Despite its impressive size, few tourists make it to Southern Namibia to marvel at it. The canyon’s origin is the separation of the Gondwana supercontinent, an event that shaped much of the landscapes of Southern Africa today. Most travelers take a relaxing approach and head to the canyon rim in the evening with some cold Windhoek Lagers to watch the sunset. Adventurous travelers can descend down the 550 meters to the canyon floor for an active adventure. This hiking option is only available a few months out of the year due to seasonal extreme heat and flash flooding. Should you choose to accept the challenge, and visit at the right time of year, the hike takes around five days and covers 88 kilometers of the canyon floor. Located outside of Rundu and the neighboring Hakusembe lodge along the Okavango River lies the Mbunza Living Museum. Set up by the Living Culture Foundation, a Namibian nonprofit, the museum is both a school for traditional culture and a community-based business aimed at preserving the culture of the Kavango people, while providing an additional source of income for rural villagers. You can spend a few hours or a whole day learning about the different aspects of the local culture. I promise you will not only be entertained, but educated about rural Namibian life. There are many living museums around the country so be sure to see if there are any nearby to you! Set in a desert landscape 125 kilometers outside of Luderitz lies the tiny mountain town, Aus. This stop isn’t well known and won’t show up on many road trip itineraries, but it should. There isn’t much in Aus besides two campsites, a lodge, petrol station, restaurant, and a hotel. Located along one of the few major roads in Namibia, the B4. The B4 is largely flat, but near Aus the mountains rise up out of the desert. Catching sunrise or sunset here won’t be a disappointment. In the neighboring area of Garub—itself nothing more than a wheel and water tower in the desert—visitors can find the feral horses of the desert. They are often thought to be the only feral horses in Africa. No one is quite certain where these 150 wild desert horses originated. These special horses have adapted to the harsh desert environment and are said to able to go five days with little to no water. When we were there the horses were looking quite skinny, and were told by the Gondwana staff that human intervention had to happen during severe droughts in order to save the species. Now the Gondwana collection provides enough water and hay for the horses to survive. Once referred to as the “Gate of Hell” this stretch of coastline in Namibia is one of the least hospitable places on earth. Along the drive you won’t find much besides the find remains of shipwrecks littered along the coast. The Skeleton Coast — once the moniker of the entire coast of Namibia — now describes the stretch north of the coastal town of Swakopmund. 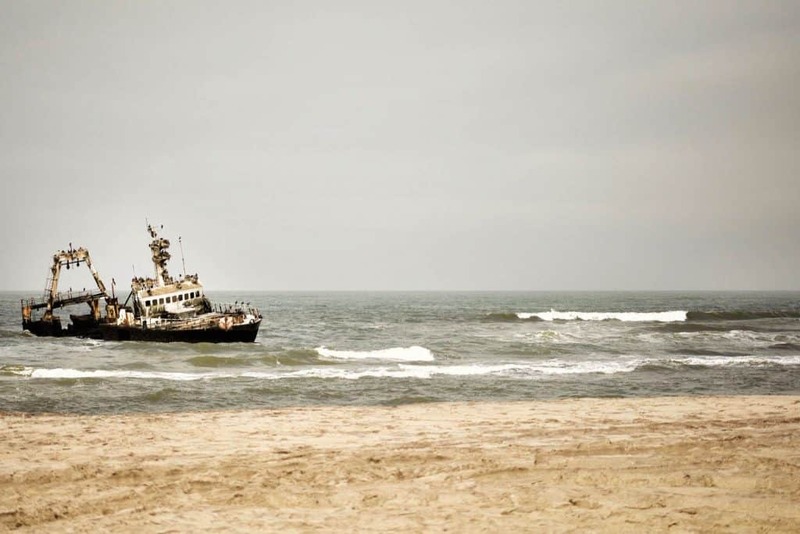 There is no place quite on earth like the Skeleton Coast. While the sand dunes and vast ocean are heart stunning the weather here is ferocious as the heat from the desert whips up massive winds from the cool and wild Atlantic Ocean. 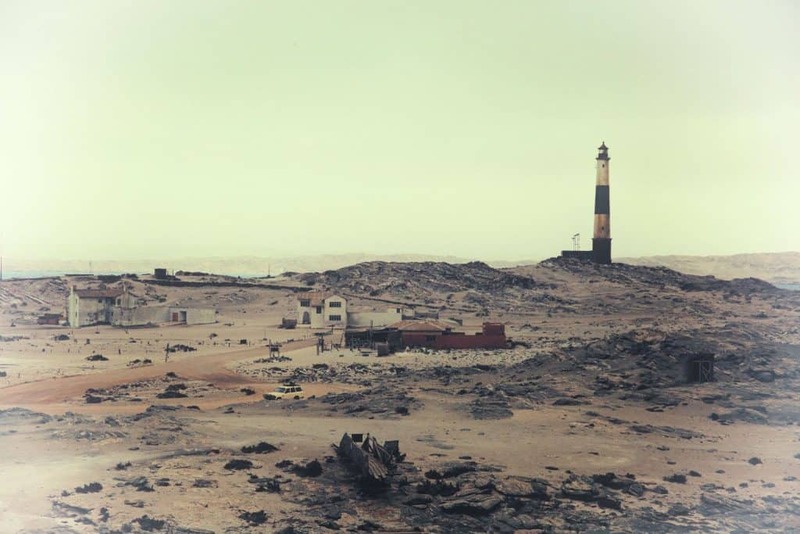 As you pass the last of crumbling fishing towns and reach the Skeleton Coast Gate complete with skull and crossbones, a sense of foreboding is inevitable. From the gate, drivers are on their own. There are no services available so it’s important that you are self-sufficient if you travel here. That means a 4×4 vehicle, enough gasoline for your trip, food, water, and god forbid know how to change a tire. Etosha National Park is arguably one of the best national parks in Africa. However, many international travelers don’t venture or think of Namibia when it comes to safari, but they should. Etosha is filled with wildlife in the massive Etosha salt pan that can even be seen from space. We spent two days on safari here and saw rhinos, lions, hyenas, giraffes, jackals, and so much more. With scarce water throughout, the local animals are forced to congregate around a limited number of watering holes meaning you can sit by one of the many watering holes and watch the wildlife come in from kilometers away. It’s one of the easiest parks in Africa to self-drive as the roads aren’t in terrible shape and signage is good. The best part about Etosha though? The price! At 80 NAD, Etosha National Park is the cheapest place in Africa for a safari. Seriously, we’ve been on safari in most of Africa’s best parks and that price can’t be beat. 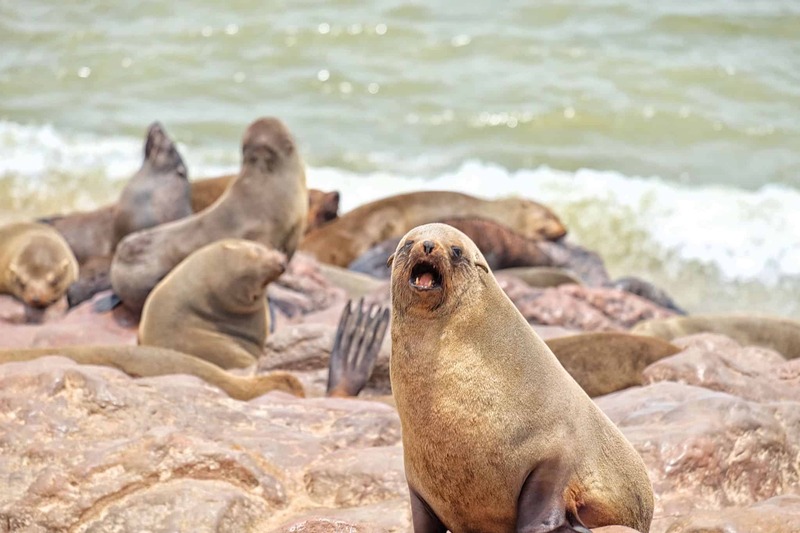 Namibia’s largest seal colony can be seen (and smelled) at Cape Cross Seal Reserve. Although you may need nose plugs, seeing 100,000 floundering and wailing beast is amazing. These fat sea mammals enjoy full advantage of the nutrient-rich Atlantic Ocean here, with large concentrations of fish concentrated along the shoreline due to the famous Benguela Current. This area is one of the few “stops” along the Skeleton Coast drive mentioned above, but it’s still close enough to Swakopmund for a day trip. Don’t forget to bring a camera and snap some photos of the seals, but be careful – they bite! Luderitz may be one of the strangest cities/towns we have ever set foot in. Originally built by German settlers, Luderitz is nestled between the turbulent Atlantic Ocean and the massive sand dunes of the Namib desert. German architecture, beer houses, and marine life dominate the town. Piles of sand blow through the streets and fill the gutters. The vibe is wonderfully strange, like something out of the twilight zone, stuck in time and almost forgotten and any visit here may make you feel as if you’re in the twilight zone. Nevertheless, it is a real and working town in Namibia and well worth a few days exploration! 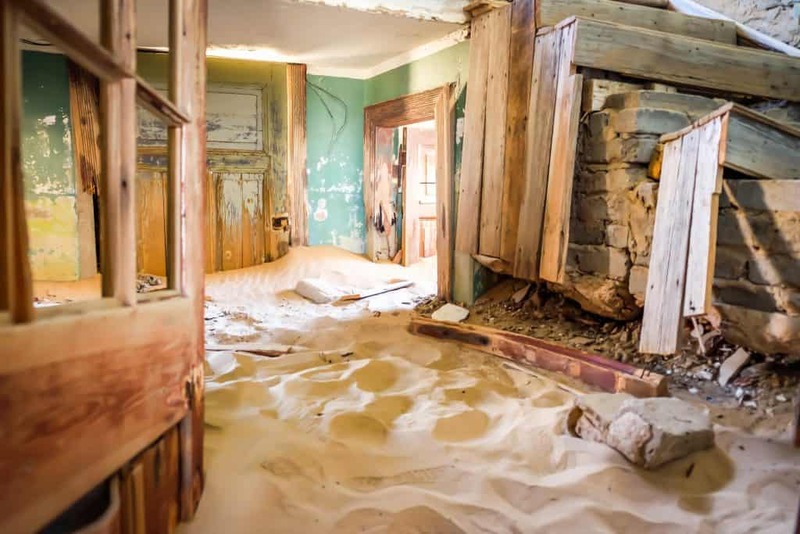 Plus it’s the gateway to the unmissable Kolmanskop! In the early 1900s, a German railway worker found a diamond lying on the ground in the desert and the rest is history. The town of Kolmanskop was quickly set up, grew in size, and the diamond mining in Namibia boomed. Kolmanskop, despite being located in the middle of the Namib desert exploited the diamond field at the turn of the century. The town was completely abandoned in the late 1950;s and now a ghost town sits in the sand dunes of the Namib Desert. In the 1980’s DeBeer turned the area into a museum and now it is one of the most photographed spots in Namibia. Daily tours provide information for visitors that wanting to learn about the area—and take stunning photographs of the decaying, abandoned buildings in the sand. Seriously, it’s hard to get a bad photo at Kolmanskop! Same-day permits are required to enter Kolmanskop and can be purchased at the gate for 75 NAD, which includes an hour-long tour that starts at 9:30 am. Plan to stay longer and wait out the crowds to get the best photos. Swakopmund is easily the hippest city in Namibia and the country’s tourism epicenter. Swakopmund is a cool, beachside retreat, providing relief from the scorching hot desert, and thus has long served the weary traveler. Since Namibia was once a German colony, you can find beer halls, plenty of bratwursts, and colorful wooden homes here. You can also acquire almost anything you need to tackle the surrounding desert. The desert is never forgotten, though as sand dunes surround the city and roll into the wild Atlantic Ocean. Swakopmund is the ultimate destination for adventure in Namibia. Entertain yourself with sandboarding, four-wheeling, paragliding, or skydiving — all on or over the Namib desert. The unique geology and beautiful views have attracted humankind throughout history, and so, a large number of bushmen paintings can be found on the granite mountain. Spitskoppe is a fantastic destination for hiking, climbing, and photography. 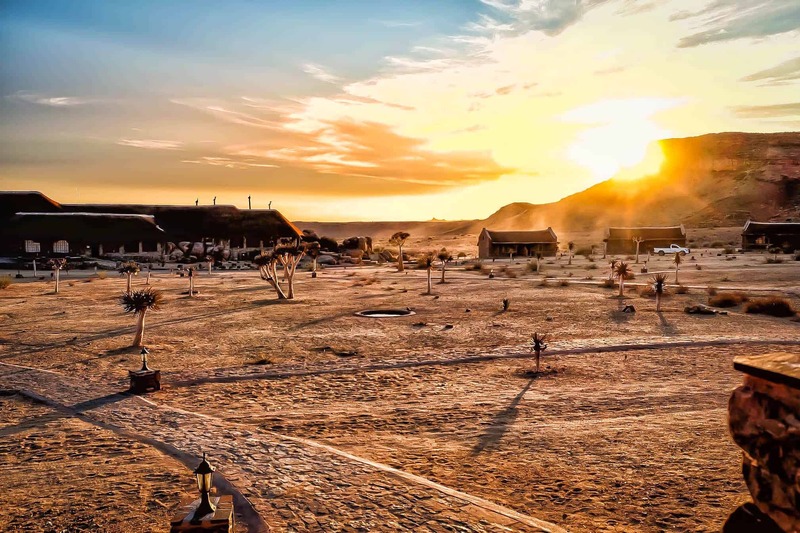 Visitors may make it a day trip from nearby Swakopmund, or stay even closer to the mountain at a small community-run desert campsite. Have you ever tried snowboarding? Now think about switching out that fresh powdery snow for some harsh desert sand and riding it. That is sandboarding in a nutshell. A few kilometers outside of Swakopmund lies the “perfect” dune for sandboarding. With six different faces and a towering height of 100 meters visitors can have an adrenaline filled day shredding the sand. Perched on the border of Angola and Namibia, in the region of Kaokoland, these magnificent waterfalls are a series of cascades that drop a total of 60 meters over 1.5 kilometers. At their most impressive point, the falls span across 500 meters before dropping and creating a beautiful mist. The whole area up to and around the falls is unspoiled wilderness with baobabs, wild fig trees, and makalani palms lining the river and road. The falls are easy to reach in all seasons. A high clearance vehicle is recommended but not required; unless you’re traveling in the wet season, in which case it’s advisable to come in a 4×4. You will be best off making the journey equipped for camping with your own food, as there are four small camps/lodges that are located in proximity to the falls. Like South Africa, the braai culture is strong in Namibia. Braai is Afrikaans for “grilled meat” and that’s what a braai is all about. A bunch of grilled meat. “Having a braai,” means someone is having a social gathering that is very similar to a BBQ. We’ve become quite custom to the typical Southern African braai now. Braai can consist of any meat but the two most common items are beef and a spiced sausage called boerewors. This is typically served with “pap” Afrikaans for maize porridge and a relish which is green vegetables cooked down. In general, Namibia is a very meaty country, and vegetarians may find it hard to find the food they want in this desert country – but of course it can be done! We love going on bush walks around Africa as it allows us to explore the African beauty up close. It’s not the time to see big game (although it’s possible), but to explore the intricacy of the desert eco system. You can learn about plants and insects of desert such as the sand snake or toktokkie. It’s also when you can see snakes, reptiles, droppings, and analyze footprints without the nuisance of a loud engine. You’ll want some good safari boots and a safari hat for this activity. We found the land borders hassle free for self-drivers. Self-Driving is the most popular way of getting around Namibia. Distances are great and petrol stations are scarce so buy a map and plan. Visitors will be able to get by fine with English in Namibia. The majority of Namibians are some exceptionally friendly people. We felt very safe traveling in Namibia, but did not go to Windhoek as we felt no need to see another big city. Visitors will be able to get about anything they need in Swakopmund and Windhoek. Don’t expect common amenities in many of the other towns.